There’s no doubt that time can be a major barrier to eating a healthy breakfast each day. You may be feeling like, no matter how hard you try to squeeze it in, there's just not enough time in the morning to actually make and eat breakfast. Thankfully, there are a few things you can do to give yourself a little more time in the morning make breakfast a reality. When it comes to breakfast, one of the most helpful things you can do is prep ahead of time. Doing something as simple as roasting a pan of sweet potatoes over the weekend, prepping a smoothie the night before, or making a batch of chia seed pudding can make your morning easier and eating breakfast more attainable. Some breakfast recipes lend themselves to being prepped ahead of time better than others. Thankfully, there are plenty of recipes that taste absolutely delicious when they’re made ahead of time and I’m sharing ten of my favorites with you today! All of these recipes are great options to meal prep and give you just enough leftovers for those busy weeks when you just need to grab something and go! Why it’s great to make ahead: These potatoes are the perfect thing to make Sunday afternoon as you’re getting ready for a new week. All you have to do is dice up a few potatoes, lay them on a sheet pan, and let them roast while you’re doing all your Sunday prep things. You can easily reheat these in the oven or microwave the morning you’re ready to eat them. Try serving them with a fried egg and some sautéed spinach. Why it’s great to make ahead: You can prep these smoothie jars over the weekend or even the night before. When you’re ready to make a smoothie, just pour the jar ingredients into a blender, add your liquid, and blend! Why it’s great to make ahead: Egg muffins are great because they’re portable and can last a few days in the fridge. You can reheat these muffins in the microwave by heating them for 30 seconds at a time until they’re hot. Or, you can pop them in the toaster oven or conventional oven while you’re getting ready in the morning until they’re warmed through. Why it’s great to make ahead: These gluten-free Banana Nut Breakfast Muffins freeze and reheat really well, which make them a perfect make ahead breakfast recipe. Most of the work for these muffins is done in a food processor which makes them super easy to whip up. Once you make a batch, you can freeze them and then pull them out as needed in the morning. Pop them in the oven at 350 degrees for just a few minutes and they’ll be warm and delicious and taste like they were freshly baked. 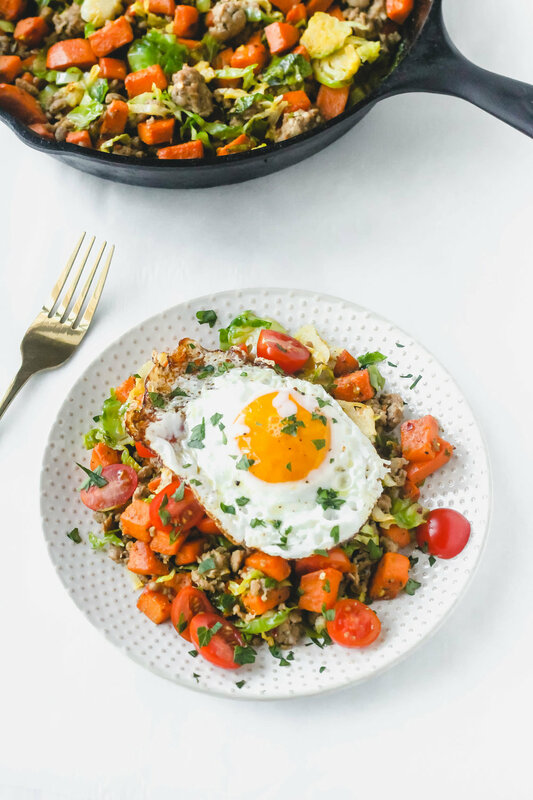 Why it’s great to make ahead: If you’re more of a savory breakfast person, this Sweet Potato and Brussel Sprouts Hash is exactly what you may be craving for breakfast. This recipe makes enough for a few mornings of leftovers. You can reheat it in the microwave or skillet! Why it’s great to make ahead: Just like the five-ingredient chia seed pudding above, this chocolate almond butter chia seed pudding takes around five minutes to make. You can prep it the night before for a quick breakfast that’s a little more decadent than the norm. Why it’s great to make ahead: The Sweet Potato and Sausage Frittata is the perfect make ahead breakfast for a family and can even double as a great brunch recipe! It’s packed full of veggies, too, so you get a healthy breakfast packed with a punch of vitamins and nutrients. Why it’s great to make ahead: These Whole30 Roasted Breakfast Potatoes are one of the most popular All the Healthy Things recipes and for good reason. They’re crispy, delicious, and can actually be reheated in an oven for quick breakfast option. Try pairing these potatoes with chicken sausage or eggs! Why it’s great to make ahead: This Sausage and Potato Frittata is another great crowd pleasing option, especially if you have a family to feed. Try adding different veggies or al little cheese to make it your own. You can reheat it in the microwave or oven on those busy mornings when you need a filling breakfast!